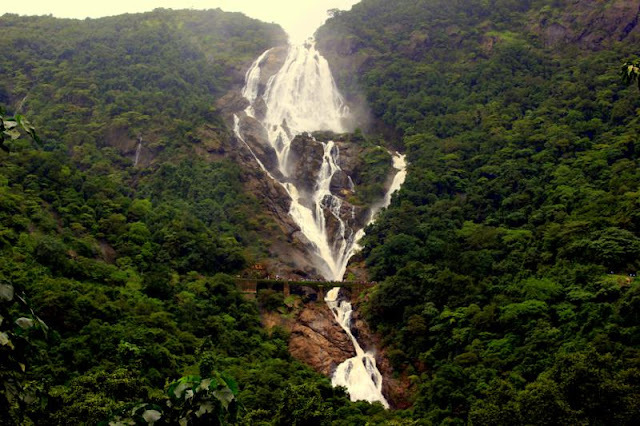 I think no intro is needed for the Dudhsagar waterfalls trek. This was my second time trekking to dudhsagar waterfalls, last time I went from castle rock and this time I tried the other route from Kulem. Kulem - Dudhsagar route is not so picturesque, not many caves and not many scary bridges. Stating Point : Kulem Station (6km from Mollem,Goa). Trains Info: No guarantee that the freight trains which start from kulem will have a stop @ Dudhsagar. But all the train from Dudhsagar station will stop @ Kulem. Time Taken: 3.5 hrs for one way trek with four 10 mins stops. Castle Rock or Kulem Route???? I prefer castle rock route, as it has 12 caves, scary bridges, good view of valleys. From kulem you will have the full view of waterfalls. But this full view is just 2km from dudhsagar waterfalls, so even you opted the castle rock route, you can still trek km more and can visit this view point. Should avoid going on Saturdays and Sundays. 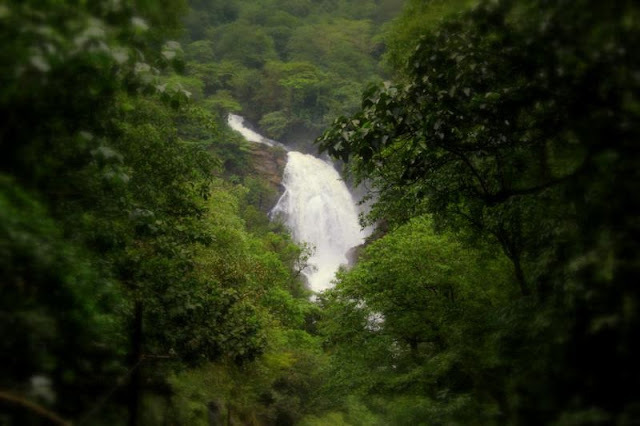 I don't want to get into details about the different ways to reach dudhsagar, as I already explained clearly in my old post: http://www.mytraveltales.in/2012/07/dudhsagar-waterfall-trek.html. 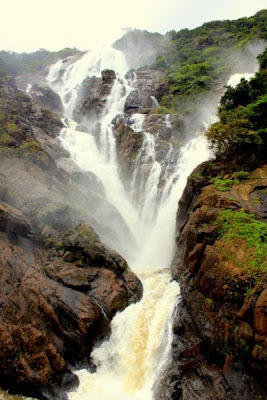 Kulem to Dudhsagar waterfall is around 11km(by walk). There are 4 caves, one station(Sonalium) in between these two places. Please carry water bottles, food @ kulem, you wont find anything in between the trek. 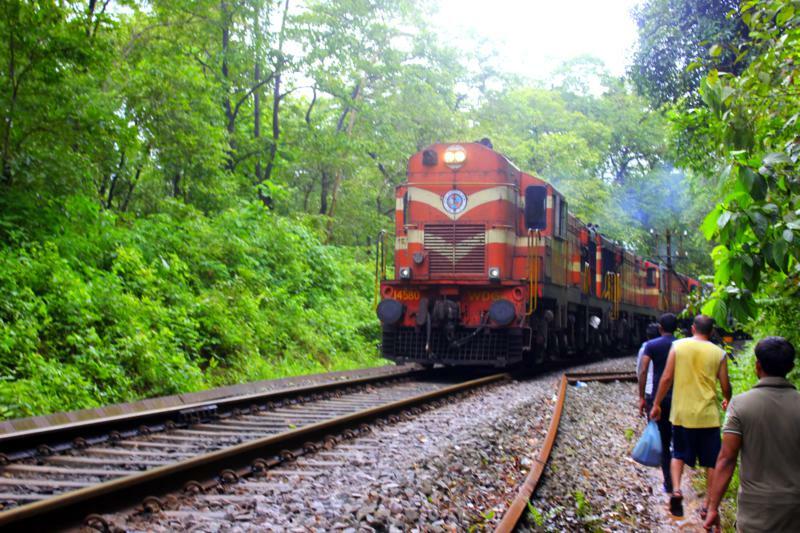 Also there is a Jeep route from kulem to Dudhsagar(base, not till railway track), which will be closed during monsoon. But Bike taxi's will be available in monsoon. 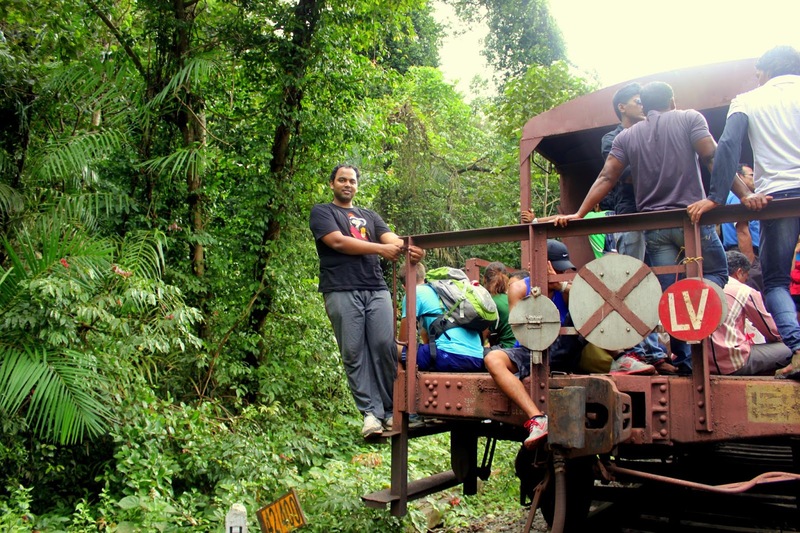 Prefer trekking on the railway track rather than trekking on the jeep route in monsoon. We initially planned to reach kulem by 8Am(sunday) and board the train from Kulem -> Dudhsagar (Amaravathi Express - run weekly). And planned to trek from dudhsagar -> Kulem. But because of the Saturday late night parties, we started from Panjim @10AM and reached Kulem @11.30AM. The route was good, no police checkings, not much traffic and smooth drive. To reach kulem, you have to take a right turn @ Mollem petrol bunk, before mollem checkpost. Kulem is around 6km from Mollem. Kulem is very small place, but you will get all basic stuff. We parked our vehicle near the railway station and started our trek. Our target was to reach dudhsagar by 2PM, so with out any delays we started our trek. We started our trek @ around 11.30AM and planned to reach Sonalium(8km) by 1.30 PM. So we walked at a good pace till first few kms. The route is completely covered with big trees, greenary everywhere, small streams, monkeys. If you don't want to walk on the railway track, there is a small way just besides the track which is plain and very easy to walk.But that plain path is present only till 3km from kulem. In monsoon bikes taxi guys will use this path. After walking for almost 1 hour, we found one forest police check-post where they are collected a minimal amount of money for entering into the kulem reserve forest. When we asked them about the number of kms we trekked, we were shocked to know that we trekked only 3km, but we were in a impression that we trekked almost 5km. Even-though the climate was cool, there was lot of humidity, because of that we started dehydrating and everyone suffered from excessive sweating. After trekking for almost 2.5 hours, we reaches the sonalium station, from where we can able to view the dudhsagar station, but not the waterfalls. We took rest for 10 mins and then started our trek again. Sonalium station was very basic station and there is no place to camp near the station. From sonalium, the view point is just 1km. After walking for 15 mins, we were able to see the first view of the waterfalls. We have to trek for atleast 10 mins more from the first view to get the full view of waterfalls. We reached the first view after trekked for almost 3 hours. Once we saw the beautiful waterfalls, everyone was so happy and feel relaxed and this view gave an extra boost for us. I was sitting for almost 10 mins watching the beautiful view of waterfalls. We took some pictures of the views and again started our trek to waterfalls. As it was Sunday there was heavy crowd near the waterfalls. 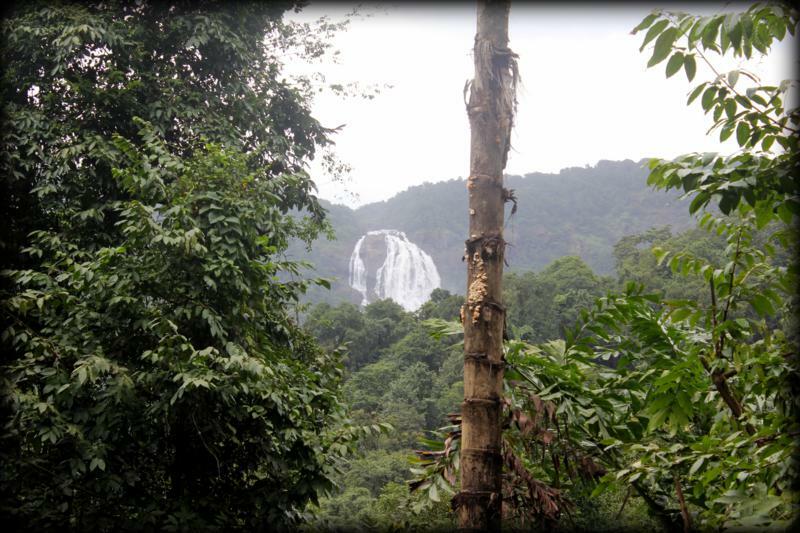 We have to trek for just 15 mins to reach the water falls from the view point. 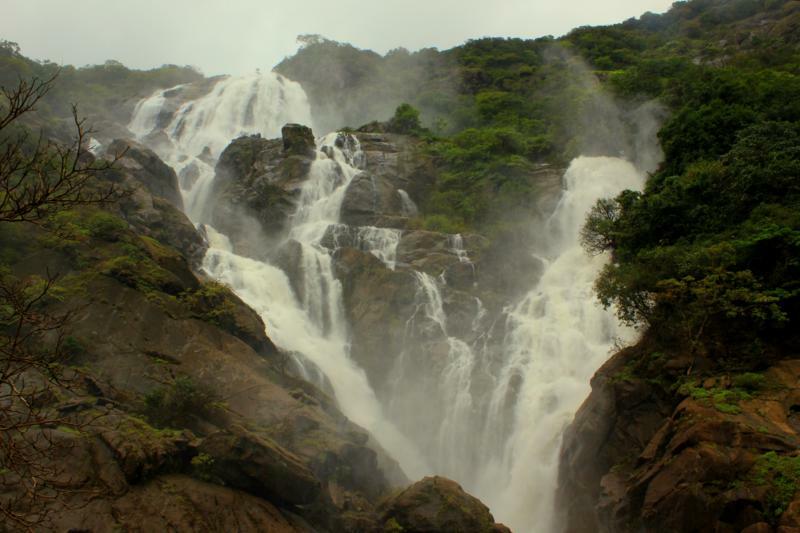 We came across some small water falls, long caves in between the view point and dudhsagar waterfalls. As it was not raining and because of no fog, we were able to get the full view of the waterfalls. As usual, Dudhsagar was majestic, roaring, flowing at full pace. But because of the time constraint we spent only 15 mins near the waterfall and started trekking towards dudhsagar station. We reached dudhsagar station @ around 3PM. 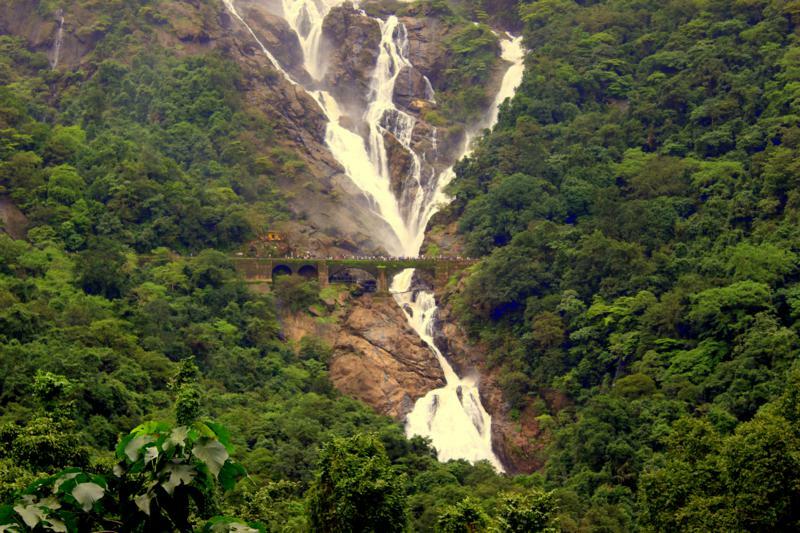 We have to trek for almost 1km to reach dudhsagar station from waterfall. I really love the first view of waterfalls from the cave that comes in between the waterfalls and the station. I also love the old dudhsagar station, which look very good in monsoon, with green patches. We reached the station by 3.45PM and enquired whether there are any freight trains that will go to kulem. But even the station manager wont be having any idea about the freight train schedules till they reach the caranzol station. Everyone in our group were very tired and they were not in a mood to trek all the way till kulem. So we waited for almost 1 hr and we came to know that there is a chance of freight train within next 30 mins. So we started moving toward the end of the station and luckily we heard the train horns. We started running toward the end of the station, as we can board only in the guard bogie. Finally we were able to catch the guard bogie and immediately train started moving. That freight train journey experience was so memorable and very exciting. Sudden breaks, jerks, views of valley, view of waterfalls from the train, everything went perfect till we reach kulem. Very nice post and great photos also. I would like to know if the train from Kollem halts at Sonalium or the Dudhsagar station. can you suggest Panjim to Kulam Station by TWO Wheeler ? Or Please suggest, is it safe to go by Activa?